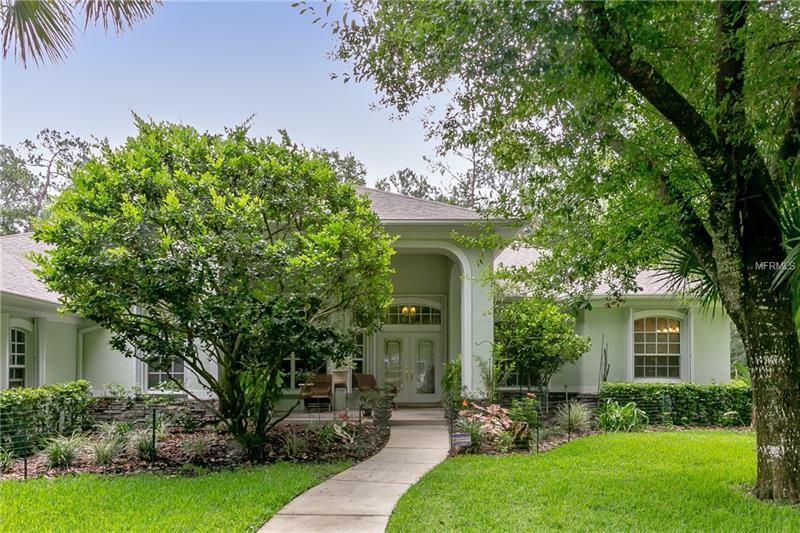 Spread out in this immaculate 4 bedroom 2.5 bath 7 car garage home located on 1.76 acres with conservation views in the Homesteads of Saddlewood Wesley Chapelâs premier gated equestrian community. This 3082 sq.ft. home features space efficiency and privacy. Upon entering youâll be welcomed by the formal dining room and living room. Down the hall youâll find an office half bathroom with a door to the lanai. French doors lead to the master suite which features walk-in his and hers closets sliders to the lanai and an oversized master bathroom with spa tub and separate walk-in shower. On the opposite end of the home there are 3 generously sized bedrooms another full bathroom laundry room and the living area. The family room features a wood burning fireplace wet bar and sliders to the lanai. The eat-in kitchen has a gas cooktop wall oven breakfast bar walk-in pantry and built-in desk space. Relax in the private backyard with conservation views. Outdoor space includes an attached 3 car garage 40âx20â lanai with outdoor kitchen detached 50âx25â 4 car garage with door screens ($70000) extended driveway and oversized concrete apron. Upgrades include a new 30-year dimensional shingle roof ($19000) custom hurricane shutters ($18000) 3M Scotchshield Ultra Safety and Security anti-shatter window film tankless hot water heater well irrigation security system and water softener.